Why Travel Ferdz of Ironwulf.net? 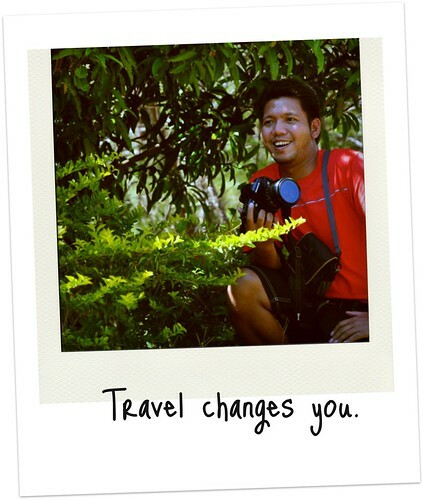 Ferdz constantly inspires us with his ceaseless passion for travel and the Philippines. He's been blogging since 2003 and continues to fascinate and inspire us with one stunning photo to another. He somehow found the time in between al that and co-founded the photography workshop and tour site, Backpack Photography. We'd like to think of him and Estan as the big brothers (in the online world) that we've never had. At first it was to rekindle the joy of being on the road. When I was a kid our family usually goes on a road trip, either North Luzon or down to my mom's province in Bicol and somewhere in between. But growing up along the way, it stopped. My early years of being employed gave me enough independence to travel and recapture that fun. To prove to myself that I can travel, even independently. I may have hooked with a group early on but my solo travel sparked the intensity to travel more. The feeling of both fear and excitement building up as I travel to an unknown destination for the first time was unforgettable. And going back home safe and satisfied was an accomplishment. The more I travel, the more the world opens up around me. It expands your horizon and gives you a new perspective on world conditions without even knowing. It's a great feeling to learn and connect with the people and the environment. It changes you. Are you an itinerary-planning junkie who wants to know everything and anything about your next destination (like someone we know whose name rhymes with Fifi)? Ferdz' is your guy if you're planning that getaway to El Nido, Batanes, Catanduanes and other beautiful places in the Philippines. Why Travel Wednesdays is a weekly series we're running. We're featuring fellow travelers and asking them the question: Why do you travel? Perhaps it will encourage more of us to walk the road less travelled and wrap our arms around the world one trip at a time! Next week, we're excited to feature the 2010 Philippine Blog Awards Winner for Best Lifestyle Blog, Robbie Bautista of TheCreativeDork.com. idol ko si ferdz at estan! Doesn't his stunning photos showcase the raw beauty of the Philippines? No, thank YOU Ferdz for shing your pssion, talent and love to the rest of us. Happy Travels!